First of all, let me introduce Gabe. 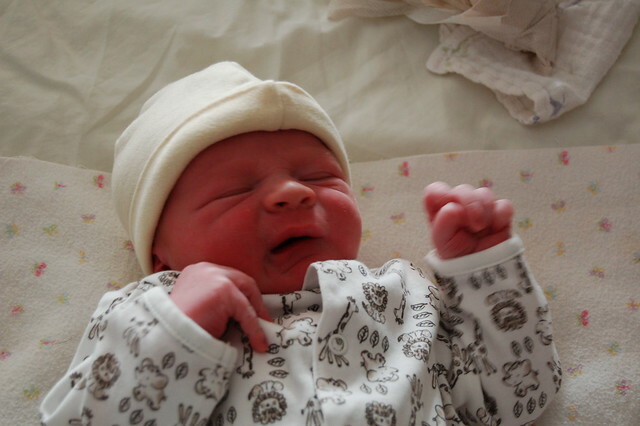 Gabriel Victor Gorman, born November 25, 2011. Around 9:30 on Friday morning, it became clear that Jessica’s water had broken, but her contractions hadn’t started yet. We told the midwives to start heading over and I started getting the room ready for the new baby’s arrival, feeling confident that I had more time than I needed. At 10:05, things seemed to be starting up, so I called Bill and told him to come over so the he could watch Abigail. Our first midwife arrived at about 10:45. The second got there around five minutes later. 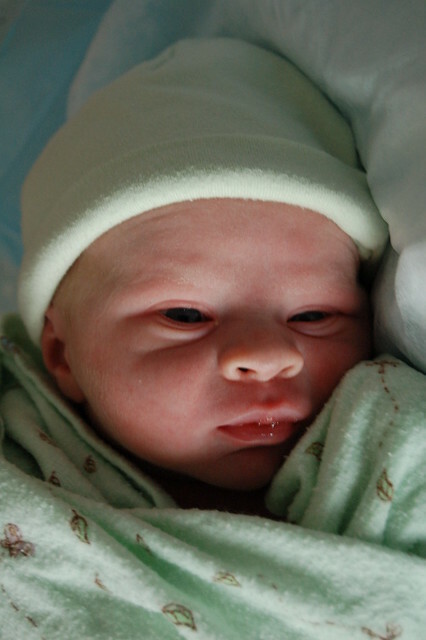 Gabe was born at 10:56. Jessica does not mess around when it’s time to have a baby. Abigail was at her mother’s side the whole time, observing, fascinated, not making a sound. She had two questions after the fact. The first was about the noises Momma was making. 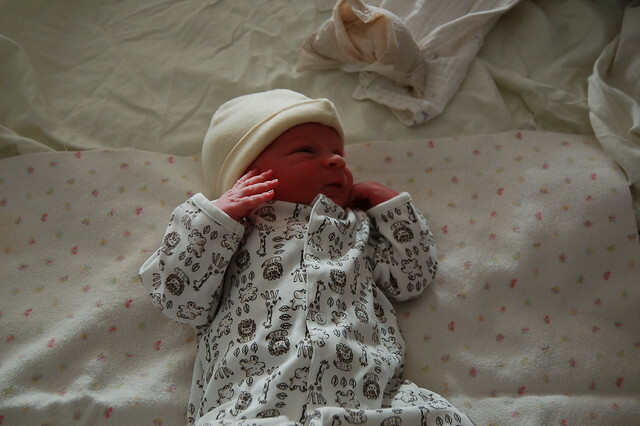 The second was why the midwives helped me dress the baby. Other than that, it was just a really interesting show to watch. 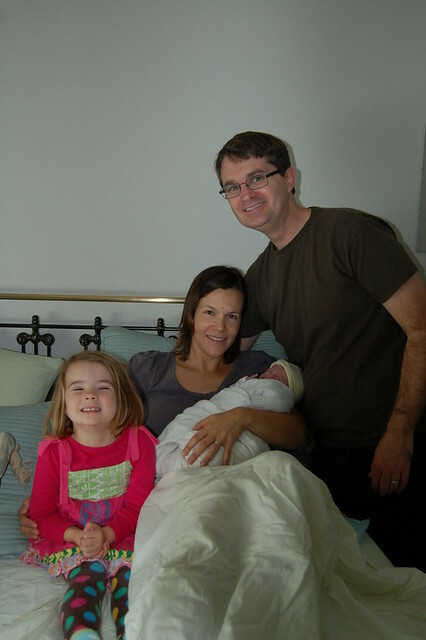 And now we have a baby, so the whole thing has been a big win for her so far. This next photo is going to be one of my all-time favorites for life. Gabe almost immediately displayed his solidarity with OWS. Here are our mid-wives, Jamin and La Shel, filling in for me in our photo composition. A wider view of the Gabe and his first outfit. We settled on a lions and giraffes them through a strict, grab-from-the-top-of-the-pile system. And the required weigh-in shot. The feet are really the highlight. This entry was posted in Abigailia, Gabriality and tagged Birth, Gabe, Giraffes. Bookmark the permalink. I’m so excited! Great pictures. Congrats you guys. Can’t wait to meet him in person. Amazing. Sending love your way. He is beautiful! Congratulations. 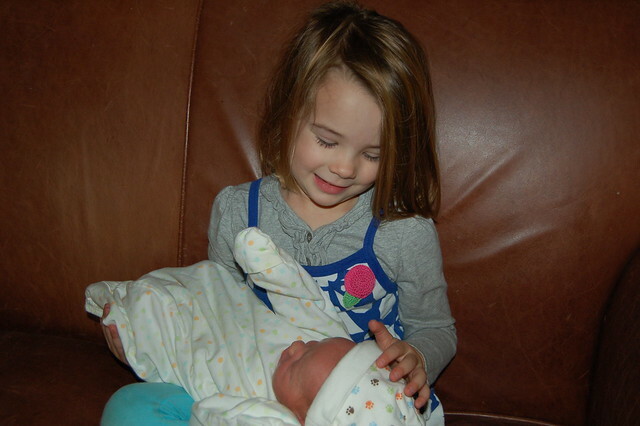 Abigail looks so happy to be a “big sister”. So cute!! Abbi is such a good nurse!! Congratulations to all of you!!! Jessica you are amazing! You pop the baby so fast!!! It took me 18 hrs with all my 3 kids!! Lovely pictures!!! Amazing is the first word that comes to mind, the fast birth,the beautiful baby boy whose name we love, the adorable picture of big sis with her baby brother, Jess looking like its just another regular day as usual and the overall family happiness that shows with those big smiles. WOW, when it is time, it is time. What a memorable and fabulous experience for all. We wish you all much happiness! Just got your announcement from Bill — WHAT A BLESSED, HAPPY DAY!! Gabriel is absolutely beautiful and looks so perfect. I am so glad you had a boy… they are a unique “raising” experience, to say the least. Jess – you had such a fast delivery… the easy ones make you want to have more.. I am so glad Abigail was able to attend the birth.. she is already bonded with Gabriel. Well, you and Alex surely make beautiful children…. Congratulations on your creativeness. Dave and I wish you and your family all the happiness you can stand. Congratulations to Jessica, Alex and Abigail. Congrats to Grandpa Bill! What a hadsome little guy! Abigail looks adorable with his baby brother. I see nothing but love and joy here. You are all so fortunate. He’s a beautiful boy, part of a beautiful family. We’re so happy for you. We wish we were there to give you all a big hug. The name, perfect. It really touched my heart to read what you named him. Thank you. Beautiful family! You will cherish these very special moments forever. Congratulations and joy to all. What a beautiful boy and what a wonderful blessing! 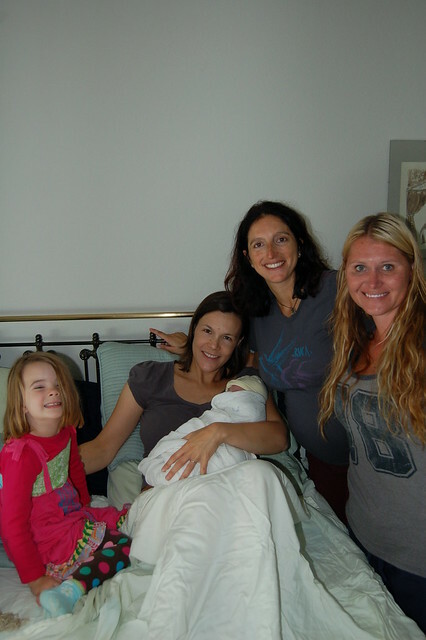 Congratulations to all of you, and what a fitting name for this little angel…! Alex & Jess & Abigail & Gabriel – Beautiful family! All the best to you from New York City!